The UP Fighting Maroons are finally streaking in Season 80. They narrowly escaped the NU Bulldogs to put together their first winning streak of the season. The Fighting Maroons got big games from the Gomez De Liano brothers. Juan filled up the stat sheet with 20 points, seven rebounds and six assists. Javi had a 19-8-4 statline. Bright Akhuetie led the Maroons with 21 points and 20 rebounds. The brothers were on point early in the game. From a tied score in the first quarter, the Fighting Maroons put together a 17-3 run with highlights from Javi and Juan. The run was sparked by an alley-oop fastbreak connection with Juan lofting a pass to Javi. A few plays later Juan threaded a sweet bounce pass to Paul Desiderio for the easy finish. Juan added a three-pointer from the left corner and Javi scored in the paint to give UP the double-digit lead. The Bulldogs refused to let the Maroons run away with the game. They quickly cut the lead down to just seven points behind Joshua Sinclair’s scoring. In the third period they were able to stay within striking distance as Dave Ildefonso came alive. NU continued to stay on UP’s heels in the fourth quarter with Issa Gaye leading the charge. UP managed to stay safely ahead with key hits from Bright Akhuetie and Desiderio. They looked like they had the win safe in their hands with a six-point lead and only 30 seconds left in the game. 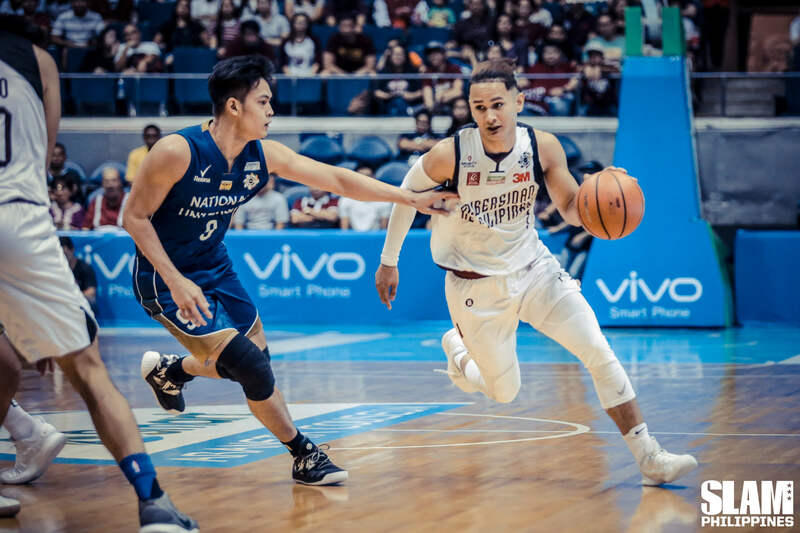 But the Fighting Maroons bobbled the ball in back-to-back possessions allowing the Ildefonso brothers to go on a 5-0 run to cut the lead down to just one. NU had a chance to win the game but JV Gallego passed the ball to Ildefonso as time expired giving UP the win. The Adamson Falcons are perfect no more. It took an extra five minutes but the FEU Tamaraws finally completed what five other UAAP teams couldn’t do. 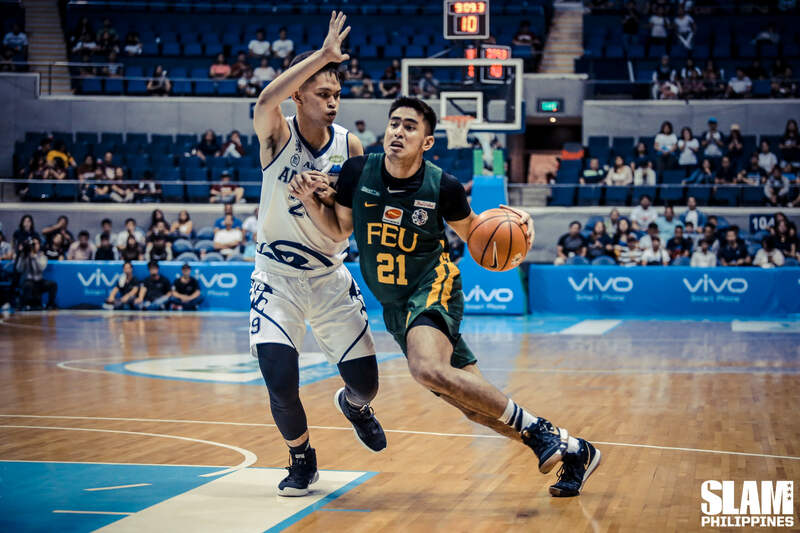 The Tamaraws used a total team effort to hand the Falcons their first loss of the season. Arvin Tolentino led FEU with 19 points. Hubert Cani and Wendell Comboy added 14 and 13 respectively. Adamson took the lead early in the first period with Sean Manganti waxing hot from beyond the arc. But the Tamaraws took over the game in the second quarter. Cani and Barkley Ebona came off the bench to score 14 of the team’s 27 points in the period. The FEU defense also limited Adamson to just 15 points in the same stretch to take nine-lead heading to the half. The Tamaraws continued their charge in the third quarter. FEU just couldn’t miss as Tolentino, Cani and Comboy were all dropping buckets in the third period. They built a lead as large as 17 points before settling for a 15-point margin heading into the final period. Just when everything seemed to be going FEU’s way. The Falcons made their run. Adamson unleashed a 17-4 run the the final quarter to get back in the game. Simon Camacho energized the Falcons with his defense and hustle while Jerom Lastimosa and Sean Manganti provided the buckets. Manganti’s floater inside the final minute gave Adamson a one-point lead. Prince Orizu was fouled on a put back in the next possession. He made the first to tie the game but missed the second. Richard Escoto was in the right place for the offensive rebound and score to give FEU a two-point lead. With time winding down, Manganti tried to tie the game but missed his attempt. Camacho grabbed the miss and flipped in a layup to tie the game and send it to OT. The game turned frenetic in OT. The Falcons were down by one point and they trapped Comboy near the baseline. Comboy and Ebona bobbled the possession as Papi Sarr got the ball tumbling to the floor. He passed to the wrong person leading to an Ebona score to increase the lead up to three. The Tamaraw defense was aggressive in the final possessions, preventing Manganti or Jerrick Ahanmisi from launching the game-tying attempt. FEU went home with a big win.